Welcome to the beautifully delicate flutter wedding invitation from Ivy Ellen, where pretty fonts and whimsical butterflies meet to create a truly magical, bespoke-looking design. 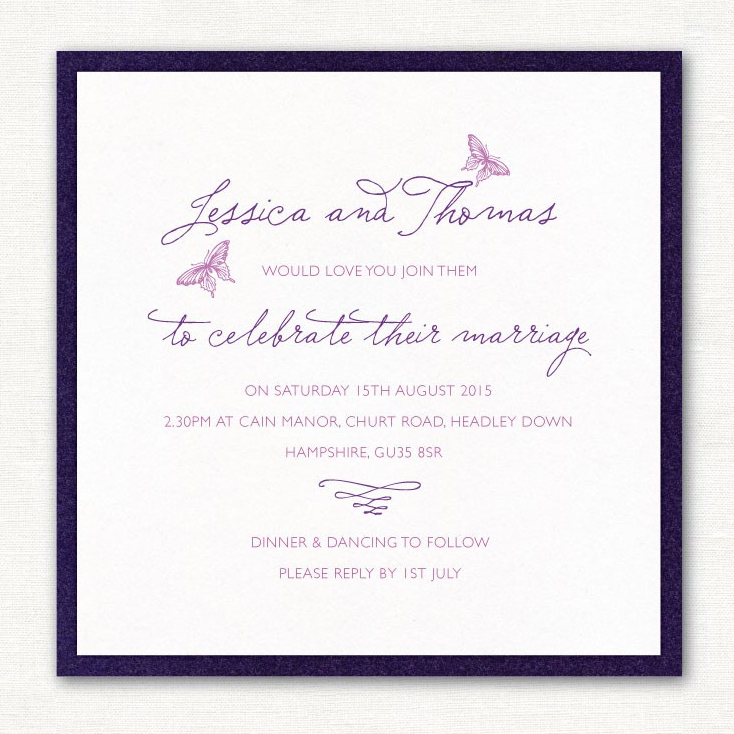 Printed in gorgeous purple hues, the Flutter wedding invitation has just the right amount of pretty and a generous dose of elegance, making this particular design perfect for numerous styles of weddings. Two ornate butterflies float between the gorgeous handwritten-style font that declares the Bride and Groom’s names and the announcement ‘to celebrate their marriage’. We love this, what we like to call, ‘swirly wurly’ writing because it really makes this invitation feel like it’s a celebration in itself! Your wedding details will be printed in a lighter colour, making use of a modern font which works beautifully to create a chic contrast with our favourite ‘swirly wurly’ writing! The Flutter invitation utilises a 150mm layered postcard style, with your details printed onto heavyweight 300gsm pearlescent white board, which is then mounted onto a layer of 300gsm coloured pearlescent board. This style works really well, adding weight and the feel of high end quality to the design which we’re sure won’t go unnoticed by your guests! 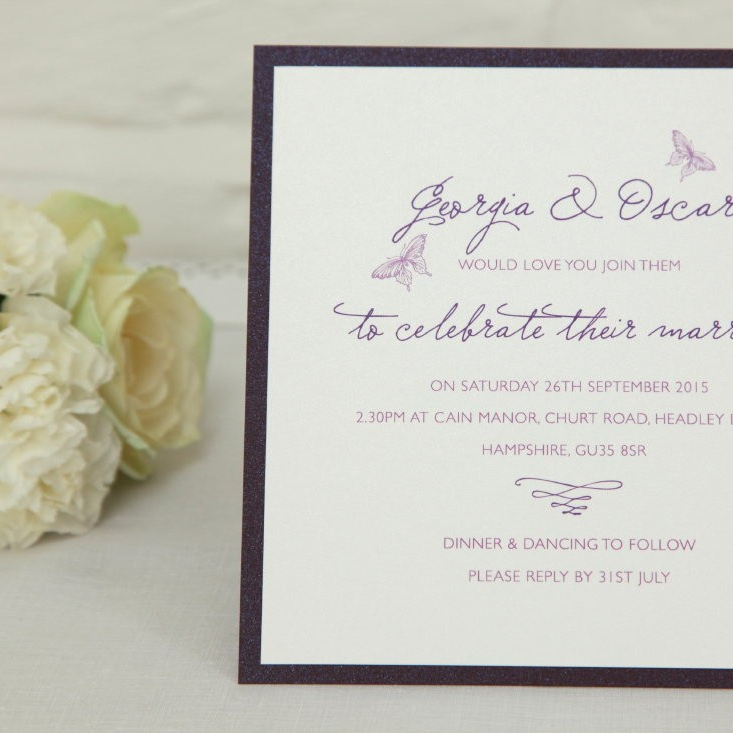 Because of the adaptability of the colour purple, you can be sure that this invitation will be easy to integrate into the rest of your wedding plans. From your flowers and cake ribbon to your table decorations and bridesmaids dresses, you can customise and colour coordinate pretty much everything with shades of violet, mauve and purple for that seamless look.